Ong Keng Sen's first production at the revamped Singapore International Festival of Arts in 2014 was Facing Goya, a peppy musical with science-heavy text that delighted nerds and confused opera geeks with its dry factuality. His swan song as festival director is pure emotion, a musical to make the heart break. Raw wails and keening from the singers on stage rivet the imagination, turning a simple set into a devastated city. Sobs, sniffles and spontaneous applause erupt even before the final lament, especially during two climactic scenes when Hecuba, Queen of Troy (singer Kim Kum Mi), spits defiance at her conquerors. Trojan Women is mesmerising, haunting, unforgettable. It may also be as polarising as Facing Goya was. It helps to have a prior understanding of the Greek myth which inspired the story and to be fond of stylised singing. Newcomers might be overwhelmed for quite a while before the aching honesty of the music draws them in. Trojan Women is set in the aftermath of a 10-year war between the Greeks and Trojans. The Greeks won and are taking the women of Troy as prizes. This is a tale told by Euripides in the pre-Christian era and retold by Jean-Paul Sartre in 1965. Ong presented Sartre's take here in 1991 and now reworks the tragedy through two Korean musical styles. The first is changgeuk, or Korean opera, which originated from a tradition of storytelling; and pansori, in which a lone singer is accompanied by perhaps a single drum. 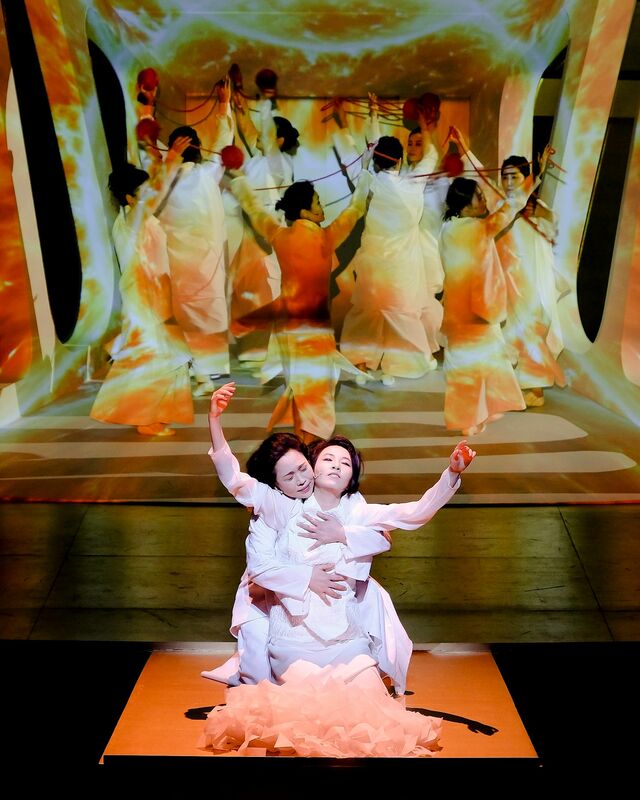 Trojan Women is closer to pansori. Each of the all-Korean cast mostly sings solo, accompanied by one or two traditional instruments played live. The singers echo, pair and follow the instruments in a style similar to traditional Hindustani music. Unlike the glissandoes and trills of Western music, the singers' voices always seem to be on the edge of cracking and end in disconcerting scoops. It works. When composer and singer Ahn Sook Sun appears on stage to begin or end the tragedy, her voice climbs up and down the haunting scale of a single flute. Surtitles are unnecessary for the Korean text written by Bae Sam Sik. Ahn's voice, always short of breaking, and the poignant flute evoke post-war desolation without the need for visuals. Ahn's pansori and the music composed by Jung Jae Il exist in the epic soundtrack niche carved out by minor keys and percussion. A range of emotions, from poignant to martial, is delivered convincingly by the cast whose silent expressions speak as much as their songs. Kim as Hecuba is the anchor of the show. She is sometimes royal, sometimes maternal, sometimes felled but never entirely defeated. She is well-matched by Yi So Yeon as Hecuba's mad daughter Cassandra and a female chorus in the Greek tradition that still allows individual voices to shine. Women are summoned, sing of their tragic fate and leave through the audience. The Greeks appear too, moving through the theatre, making the watchers complicit in the tragedy. Silent observation without action is complicity, after all. Considering this, it becomes difficult to watch dry-eyed, remembering how close the Korean peninsula is to war today. It becomes harder, thinking of the peninsula's history of subjugation and still-roiling anger over women being forced into sexual slavery as comfort women. The relentless tragedy is leavened mid-way by a farce. The Spartan king Menelaus appears (Choi Ho Sung), his hands pink with Trojan blood. He is here to kill his errant wife Helen, a clear alien among the tragic Trojans. ADMISSION: $30 to $85 from Sistic (call 6348-5555 or go to www.sistic.com.sg). Limited seats. Helen wears Greek grey instead of Trojan white. She is paired with a foreign piano instead of zithers and flutes. She is also played by a man, Kim Jun Soo, and her pleas soften Menelaus' heart. Only Helen exits the stage with a knowing smile on her face, going to a fate that she has decided for herself. In this tragedy about war and its helpless victims, it is fitting that only Helen does well out of it, Helen the politician - and the man.